The Shelf may prove to be the handiest iOS utility ever. You know how on your Mac you always drag stuff to the desktop as a kind of temporary holding spot? You might be gathering together some photos, or just keeping a PDF until you work out where to put it, or until you have emailed it and can delete the original. That kind of thing isn’t possible in iOS, because a) there is no real concept of files, at least not in the Mac way, and b) there’s no desktop. But that’s about to change in iOS 11. The new Files app takes care of a), and thirdparty apps like The Shelf will be able to take to role of the desktop. 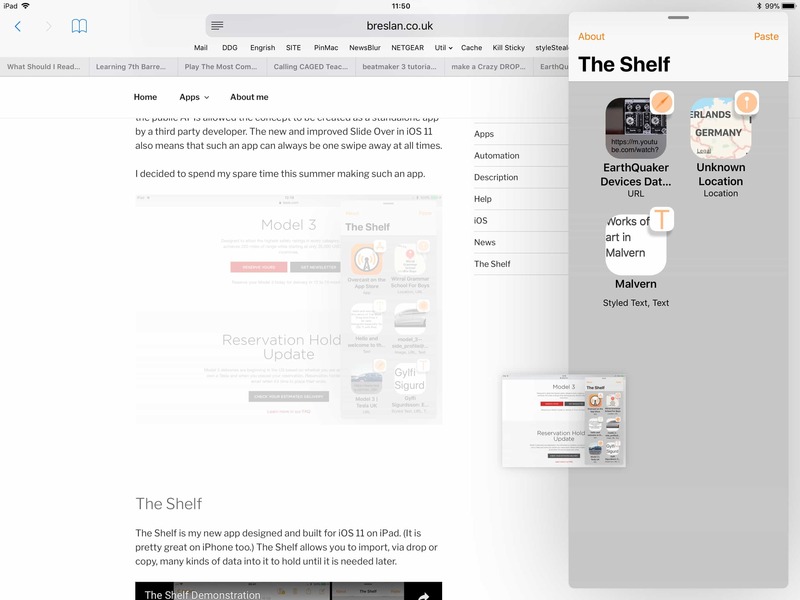 The Shelf, from U.K. developer Daniel Breslan, is a kind of slide-out desktop for the iPad. When used in split view or slide-over, you can drag and drop many files and objects straight into its window. At launch, it will work with the following data types. You just drag files into The Shelf, and leave them there until you need them. You can also copy items to the clipboard, switch to The Shelf, and hit Paste to paste them into the app — useful if you’re using the iPad with an external keyboard. The Shelf is always waiting for you. Then, when you need the items, you can drag them back out again. 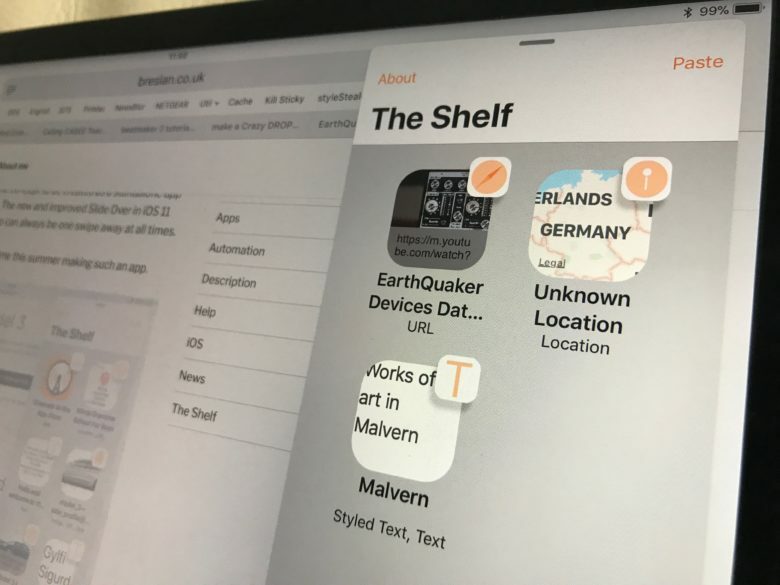 because it uses the new iOS 11 drag-and-drop to do its business, The Shelf lets you gather dropped files together by dragging one, then tapping on others to add them to the dragged pile. This lets you quickly grab a bunch of files to add to, say, an email. The Shelf also supports previews. Tap on a map location, for example, and it will preview that location in a map view, right inside The Shelf itself. And if you tap on styled text, it will show you a preview, along with options convert it to plain text, and to copy the resulting text to the clipboard. The app is still in beta, and of course requires iOS 11 to work, but it is already proving to be a super useful addition to iOS. And it will surely become an essential one when iOS 11 launches, and a lot more apps start to support drag-and-drop.